Last weekend I went out walking in Quoiggs wood as a present for someone called Darren. He was from Malaysia and he had emailed me asking if I would like a tree shrew skull as a present, then he sent through a whole load of amazing stuff that I'm going to write about later. 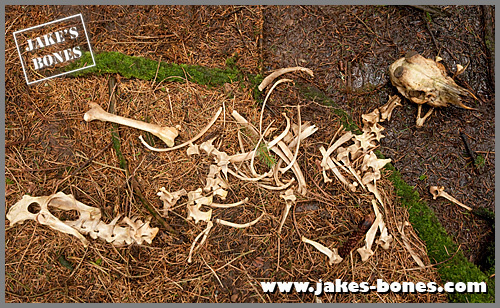 To say thanks I offered to send him a roe deer but when I looked in my spares box there wasn't one there, so I went out specially to Quoiggs Wood where I knew there were a few roe deer skeletons. It was in good condition but a little muddy so I started by using my S6 cleaner. 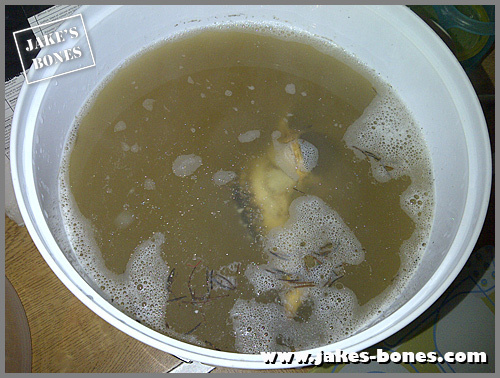 I simmered it for a few hours each time with biological washing powder. This is what it looked like after four washes. You can probably see something unusual about this skull already. 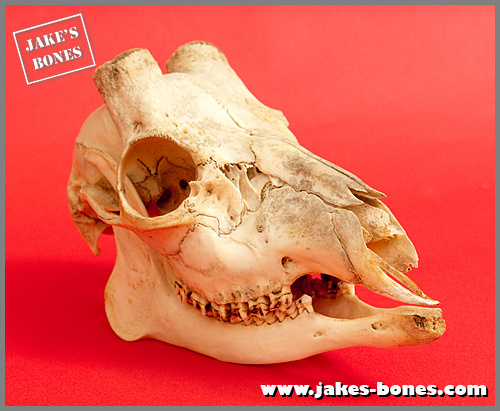 When I first saw the missing top cheek teeth I thought they must have fallen out which sometimes happens with older deer skulls. This is very unusual and the first time I had ever seen anything like this. 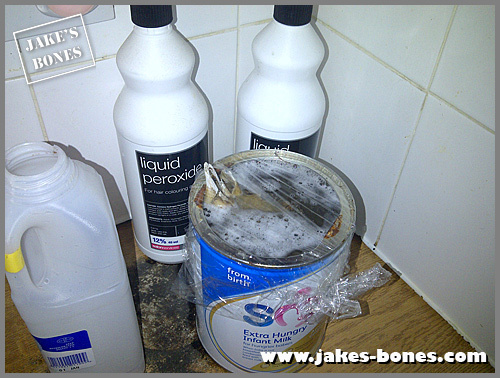 There was no obvious damage and the teeth would be inside the cheek so would be quite difficult to dislodge. I have no idea what caused it. The other thing that was odd was the lower left jaw, which would have pressed against those teeth. 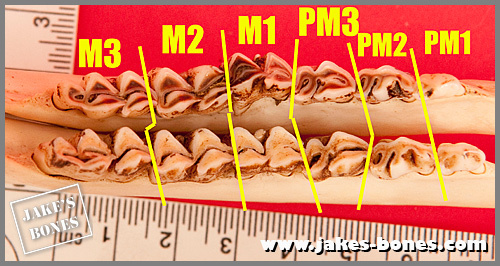 Here is the jaw with from left to right the adult premolar teeth (PM1, PM2, PM3) and the three molar teeth (M1, M2, M3). 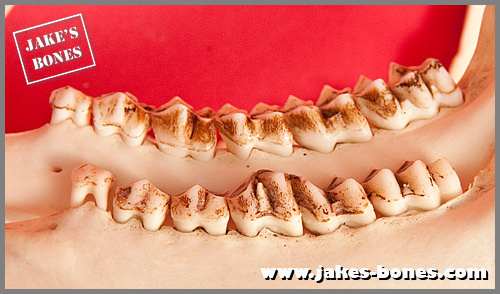 Because all six adult teeth were through that means it was at least 13 months old when it died (see my teeth guide here). Sine roe deer are born in May/June, if it died in December, it would have been 1 year and 5 months OR 2 years and five months OR three years and five months etc etc. 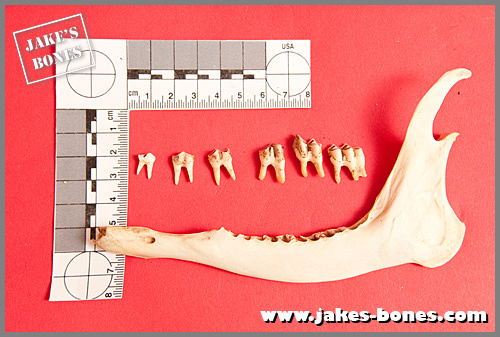 The unusual teeth are the M1 and M2 which would have gone in the gap where the missing teeth are. 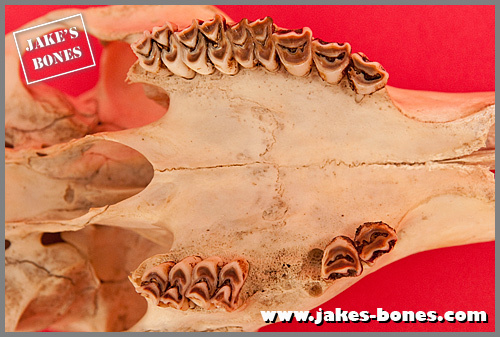 Deer teeth get worn down as they get older because they grind down food between their teeth. Because these bottom teeth didn't have anything to grind against they hadn't got worn down as much. This is the M2 where the first cusp (spike) isn't worn down but the second one is. George's cheek teeth are wider. I don't know why that is. 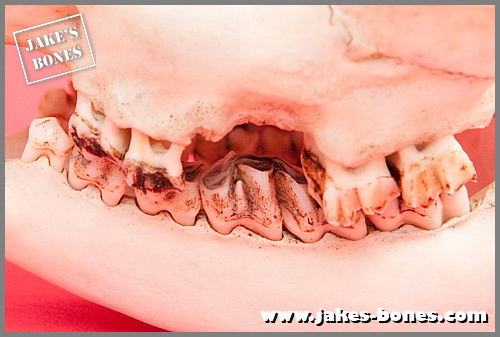 The new roe buck's teeth are more worn down. You can see it with the third tooth from the left (PM3) where the top tooth (George) has about twice as much above the gumline (the line between brown and white). George's M1 and M2 teeth (the fourth and fifth from the left) are more worn than the new roe buck's M1 and M2. 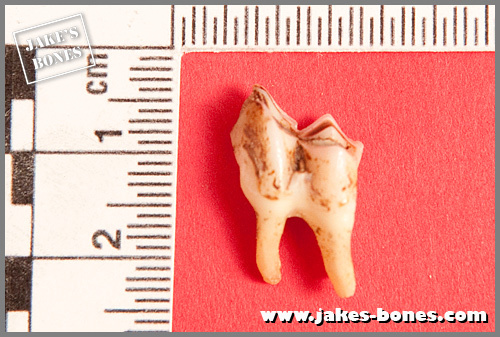 George's M1 tooth would have come through at about 2 months old, so it would have had 11 months wear by the time he died. George's M2 would have come through at about 9 months so it would have had four months wear. 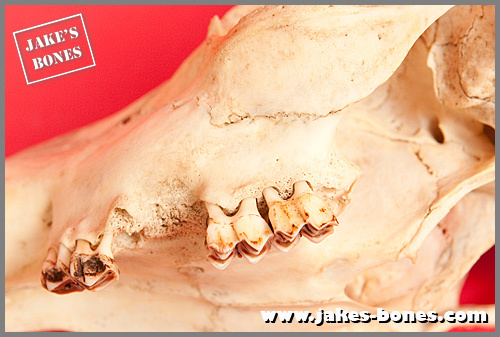 It looks like the new roe buck's teeth didn't have any wear at all, as if they had never ever rubbed against top teeth. 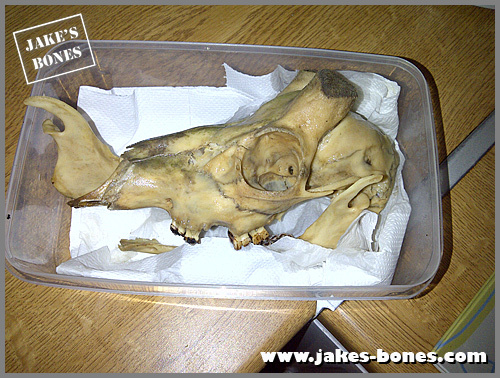 Here are the two jaws again with George's jaw at bottom and the new roe buck's jaw at top. They are the other way round than the picture above. You can see the new roe buck teeth has worn more because you can see more of the brown dentine. You can also see a slight kink in the jaw of the new roe deer skull, which might explain why George's teeth are longer side to side. 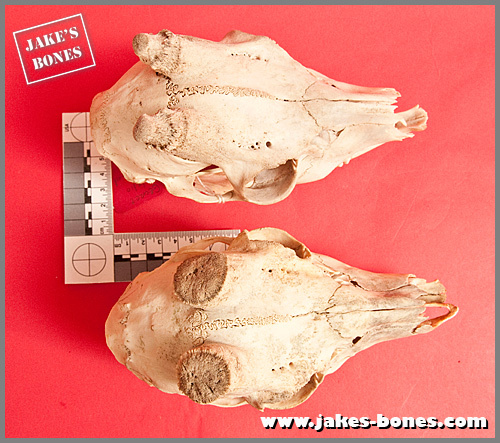 This is what the two skulls look like from above with George's skull at top and the new skull at bottom. 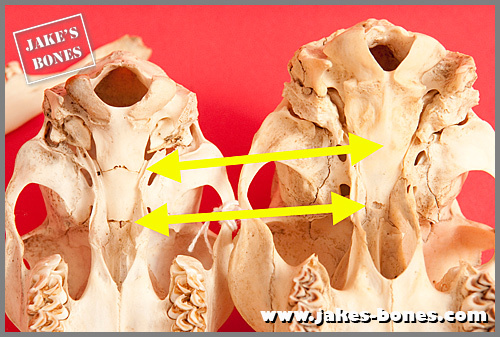 The pedicles on the new skull are much wider, which I think it because it is older. 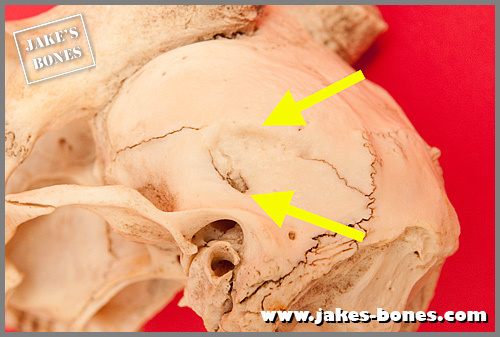 There was also something odd on the left of the braincase.There was a slight hole (bottom arrow) as if it had been injured by something going in from above, and there was a slight indentation (top arrow). 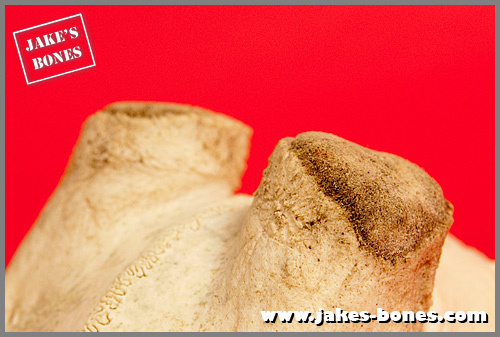 The top indentation has healed and covered up the suture (crack) between the skull plates, so it must have happened while it was alive. It didn't seem to go through into the brain case. I have still got some more work to send off before I send it off to Darren. It's not a perfect skull, but because of that I think it is more interesting that way because it tells a history of the animals life. My guess is that the roe buck had gum disease around the upper PM3 and M1, and that the teeth fell out without showing any bone damage, but I will never really know whether this is true. 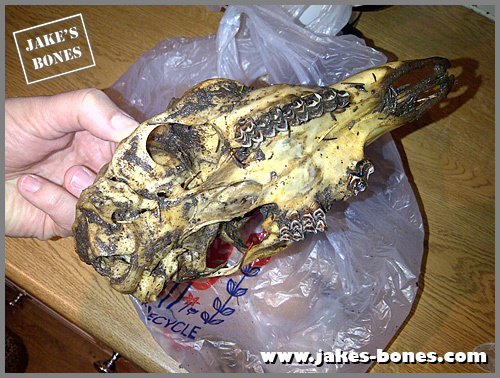 I think this is a very special skull and a very good gift for Darren :) I love the pedicles of this skull, it looks like it had strong antlers once. Too bad that they fallen off. 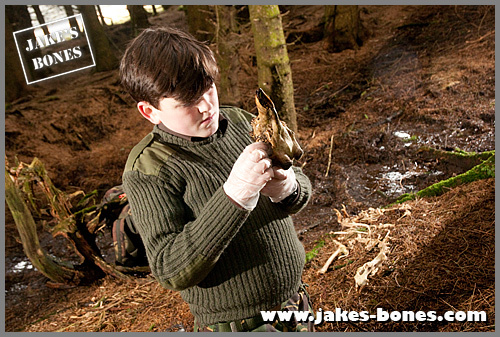 There's a lot of roe buck skulls I find with no antlers because Christmas is when they tend to die in the cold weather. 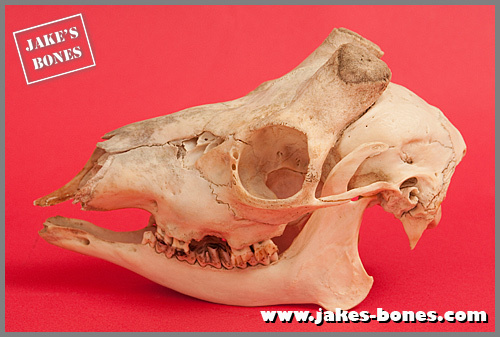 Awesome, I saw a badger skull with porous tooth sockets like that, except about half were porous and the jaw was a bit malformed.I think it got hit by a car or something. The tooth socket is very interesting. It could be old age too. I've still got some work to do and I'll let you know when I post it ! Skeletons can get buried pretty quickly even left just lying on top of the ground, but it's strange, yes. I'll think about it and try to do a post on it soon !